Purple ninja radishes have pink and red skin with small flecks of red throughout the white core of the root. Purple ninja radishes have the same spicy flavor you expect from a radish, but they are slightly firmer than other varieties thanks to a lower water content. You can eat both the root and greens of the purple ninja radish cooked or raw. Thin slices of the purple ninja radish can be used to add some bright spice to sandwiches, vegetable platters, and ceviche. Sliced radish can also be roasted, pickled, or canned. Use the greens wherever you would use heartier greens like kale or chard. These unique radishes have a white or light green outer skin and a hot pink core on the inside. Watermelon radishes have a more mild or sweet peppery flavor and a fresh crunchy texture. Watermelon radishes can be harvested when small, like a golf ball, or when larger, like a softball. This delicious radish mix variety can be served hot, cold, raw, or cooked. Watermelon radishes, thanks to their unique pop of color, are stunning when used in preparations that show off their color like sliced salads or sandwiches. Icicle radishes get their name from their long, thin, white appearance. These beautiful radishes are more mild in their pepper flavor but still have the sharp crunch found in other varietals. Icicle radishes stand out when used in their raw form and sliced, slivered, or diced. They can also be used to top tacos or garnish soups. For an interesting and mellow flavor, try roasting icicle radishes. Baywater Farms offers our freshly harvested radish mix, full of exciting and delicious varieties like those listed above. 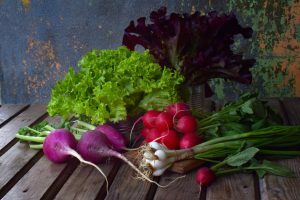 We provide radish mix to our produce distributors, restaurants, and CSAs in mixed bunches. Harvesting radishes takes skill, or they will become pithy and bitter. We harvest our early-growing-season radishes when they are smaller in size so that they don’t become too spongy or overly spicy. Our fall and winter radishes take longer to grow, so they can spend more time growing in the nutrient-rich soil without becoming hot or spongy. Store picked radish mix in your refrigerator and walk-in cooler and use them within 1 or 2 weeks. Cut off the greens and store them in plastic bags to ensure that they stay fresh for as long as possible. If you aren’t planning on using your radishes within that time period, you can pickle them or can them to enjoy their spicy bite any time of year. Our family farm grows shoulder season crops to get the most deliciousness out of every growing season that we can. Our shoulder season crops include radish mix and many other delicious fresh crops. All of our non-GMO produce is grown using heirloom seeds and sustainable farming methods so that you feel good about what you eat and what you serve. The fruits of our labor aren’t just delicious, they’re locally grown with a conscience. You can find our fresh, non-GMO rainbow carrots, field lettuces, radish mixes, fall squash, and sweet potatoes in national grocery store chains, produce distribution companies, roadside farm stands, local farm-to-table restaurants, CSAs, and farmers’ markets. To learn more about ordering our fresh local produce, click here. Our excellent sustainably grown, non-GMO produce speaks for itself, and we know your taste buds will love to listen! Baywater Farms is a sixth-generation family-owned and operated farm servicing Baltimore, Washington, D.C., Maryland, Delaware beaches, and the Eastern Shore. Baywater Farms is capable of meeting the demands of your produce distributor, restaurant produce supplier, CSA produce supplier, or wholesale produce supplier while maintaining the integrity and character of a small farm. Baywater Farms is about more than just hydroponic lettuce—we also grow heirloom beefsteak tomatoes, shishito peppers, field lettuces, custom grows, watermelon, Maryland’s own fish peppers, and more. When you work with Baywater Farms, you work with an experienced, ethical, and local farm dedicated to providing the highest-quality heirloom produce possible.